An HD upgrade of No More Heroes is coming to the PlayStation 3 with Move support. To those that say PlayStation Move is just a replica of the Wii, I point you towards No More Heroes: Paradise. You're totally right, in this case. Konami has announced that No More Heroes: Paradise is now coming to North America as an exclusive on the PlayStation 3 with support for PlayStation Move. Anyone that wants to experience one of the Wii's bloodiest and most perverted games, but didn't want to purchase the Nintendo console, will now be able to do so in gorgeous HD. 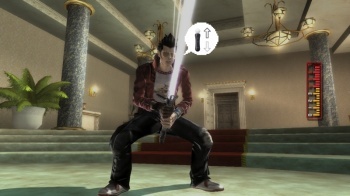 No More Heroes follows Travis Touchdown, an otaku that purchases a beam katana through the internet. This logically leads to him deciding to kill people for money. As Travis attempts to become the #1 ranked assassin in the world by knocking off the top 10 in gruesome fashion, he does a few odd jobs here and there like gathering coconuts. When he needs to save, he sits upon a porcelain throne. No More Heroes doesn't make much sense, but it is a pretty funny game. The screenshots of No More Heroes: Paradise on PS3 look gorgeous, and rightfully so, as the game already looked good on the Wii. Paradise adds new bosses and the ability to re-challenge those already defeated. Bosses in No More Heroes are similar to those from Shadow of the Colossus in that they're really the best part of the game. I'm just wondering how Paradise will handle Travis's totally bare hometown as seen on the Wii. Riding around the city streets in Touchdown's futuristic motorbike was fun, but they were completely empty and a bit ugly, to be honest. No More Heroes: Paradise is due in 2011, so if Konami added anything other than bosses and improved graphics we'll find out then.